The Company is leading manufacturer of all types of ball and roller bearings, specializing in non-standard, large and special bearings. PLT is an ISO 9001-2008 certified company, where bearings are manufactured with advance technology, production techniques, and quality control measures. They also supplies a range of bearing components that includes taper rollers, needle rollers, cylindrical rollers, steel balls and forged/ finished bearing components. Note: Columns containing 'x' indicate that this information is available only to paid subscriber. 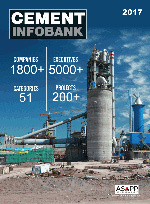 So order your copy of Cement Infobank by clicking here.